2014: the Year of the Horse, the Selfie and the vintage chic wedding. Here are this year’s hottest wedding décor trends, and tips on how to expertly incorporate them into your design. Rustic weddings aren’t limited to hoe-downs and pig roasts anymore. Recently, rustic has taken on a new life as a relaxed, yet still elegant, wedding theme. Countryside weddings in a barn, forest or farm will continue to be all the rage in 2014. 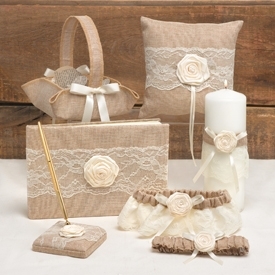 Rustic décor elements include a typewriter guest book, mason jar favours and burlap ring pillows and wraps. To achieve the rustic chic look, incorporate elements of country yesteryear into your wedding, like an old Ford pick-up truck, Earth tones and vintage jewelry – not plaid and rhinestone cowboy hats. Pink is back! Brides are beaming with love for the more subtle pinks – the nudes, the peaches, the blushes – as part of their wedding colour scheme. Although celebrities like Kailey Cuoco and Jessica Biel have opted for “girlier” champagne pink dresses, the trend has been that less is more. Think salmon pink over Pepto Bismol pink. Incorporate blush or peach rose petals throughout your décor. Pink signing stones, mixed with grey and clear signing objects, or pink favours can add subtle accents to your wedding palette. With the touted release of the Great Gatsby film last year, brides have turned to the glitz and glamour of the roaring ‘20s. Think big bands, white-gloved waiters, the Charleston, bubbly champagne and gold-rimmed china. Every wedding should be a celebration for the ages, and who threw better parties than Gatsby? To set the stage for a Gatsby wedding, introduce art deco elements into your décor, like a silver foiled guest book or Gatsby-eseque coasters. Favours and centrepieces with gold or silver trim are certainly on-trend. Nowadays, typical, scrapbook style guest books are considered passé. Brides are using uniquely creative canvasses for guests to leave their mark – memorabilia with a more practical or aesthetic purpose. “Signables” have replaced guest books, and they often tie in beautifully with the over-arching wedding theme. For example, natural stones with a signable surface or a thumbprint tree (where guests’ prints are the leaves) are perfect for rustic weddings. Shells work for a destination beach wedding, as do music records for a vintage chic wedding. From vintage-style dresses to bourgeois parasols, lace is back in a big way. But not necessarily your grandmother’s puff-sleeved, doily-looking lace that envelops the entire wedding theme. Lace accents can add a subtle elegance to your décor, especially if it’s paired with blush pinks, silver embellishments and ivory satin detailing. A staple of any classic wedding, the garter with a lace trim is a gorgeous extension of a vintage lace dress. For décor, incorporate items like a white lace aisle runner, an ivory lace ring pillow or a lace flower girl basket for optimal elegance. Who says you have to pick a colour and stick with that shade? A hot trend for 2014 is the use of gradient colours in decorative elements of your wedding. For the most part, this applies to vibrant colours like pink, orange and purple. From bouquets to the bridesmaids’ nail polish, gradients work best for the finer details. Gradient coloured rose petals, hanging lanterns or disposable cameras can be strewn around the room to add a medley of blended colours to your wedding’s decor. Do you have any wedding decor trend tips or advice for 2014? We’d love to hear it! Contact us with your requests for on-trend items – we may just add it to our catalogue!